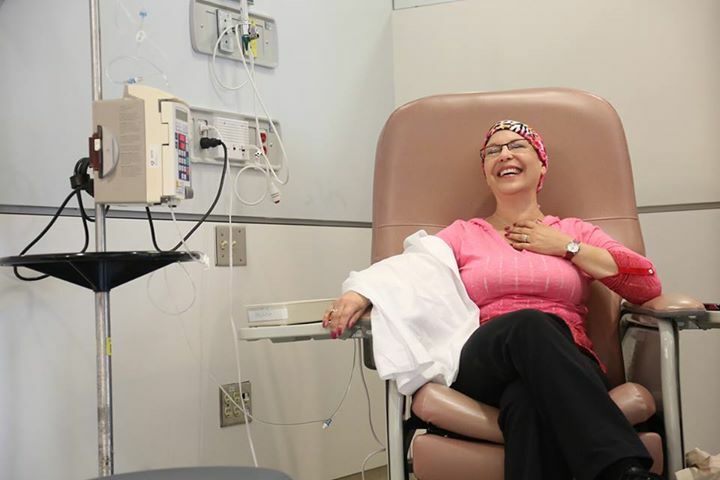 I know, it’s kind of an oxymoron…chemo, fun??? Nava picked me up and through a comedy of error, including weaving through accidents, we got there in time. Nava was so happy because the French Open semi-finals were on the big screen in the waiting room! Yes, when you go to Chemo Daycare, you get a beeper, like in a restaurant! so we watched the match. I got beeped, and told Nava to finish watching the match…she’s a diehard tennis, and Nadal fan!. So, off I went to see my favourite nurse, Manny. He is amazing, wonderful, a beautiful sole inside and out. We talked about where to put the needed as I still had some bruising from last time. Lucky me, I have hard to find veins. He found the perfect spot and we started. Anyone who has been through this knows, that you have to hydrate like crazy, so every half hour you have to go to the bathroom, good thing I was right near it!! So the timing of the drugs is important…LOL! Louise came to visit, and she looks awesome! love the new “do”. and then Nava joined us, as Nadal won..yippee!! So put 3 girls together, and we’re laughing and having fun!! The party gets even bigger when Edwin joins us! It was so amazing to see him. Edwin is an awesome friend, and the official photographer of WEWC and the RTCC, I had messaged him to invite him to come visit me in chemo as I knew he was coming in for the Ride. I was beyond excited when he said YES!! I asked him to bring his camera, I never thought I would ever in a million years ever want pictures of that, but I knew, I would be “safe” with him, and I was. We laughed, talked, took pictures, and had fun. The time flew by, it was like none of us wanted to leave! Edwin brought me a give of a UCLA sweatshirt in pink (of course) to match his blue one! and of course he was bang on picking the right size. 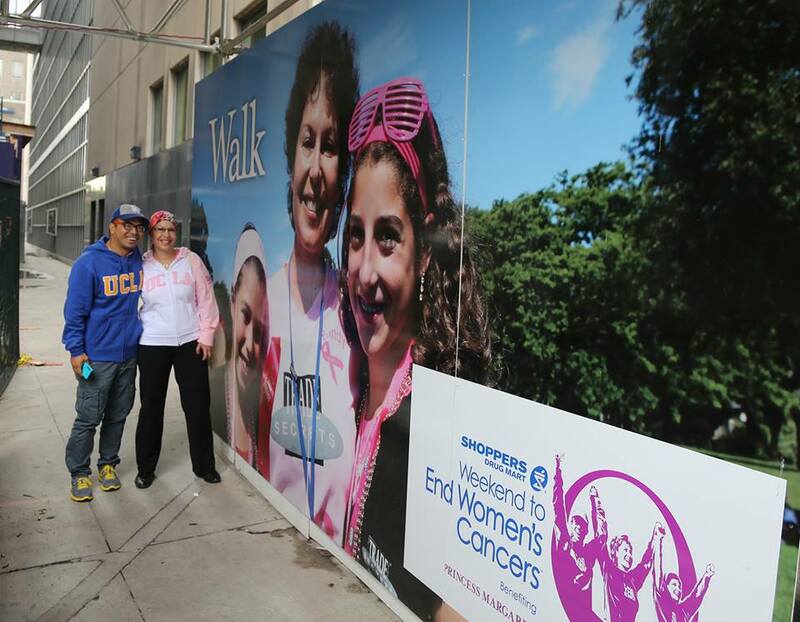 The picture outside PMCC is from a few years ago with my girls at the walk that, it seemed only fitting that we take a picture there, as Edwin took that picture, and we could show off our matching sweatshirts. In all seriousness, Edwin’s visit, along with Louise & Nava, brightened my day so much, that I really didn’t even think about why I was there, and what I was there for. Nava took me for a quick lunch, and then I went home for a nap. I felt really good, and stayed up till around 9 and went back to sleep. I woke up this morning feeling really good. I promise I’ll be taking it easy today. It was my brother Wayne’s birthday yesterday, and as he is the ultimate in celebrating, we will go to celebrate with him tonight. Today is the start of Ride to Conquer Cancer benefitting the Princess Margaret Cancer Foundation, and this event raise $19.1 Million $$ this year!! whoot whoot! To everyone involved…have a safe and fun event. Lots of other events this weekend, Relay for Life, and in Winnipeg, the 28km Walk for Cancer. Please get involved in anyway you can. You make a difference in people’s lives. What a delightful story. You are awesome at this blog thingy. Thanks so very much for sharing your journey with us. Thanks for this Randy, it is so great that you have these people there to support you. You rocked the scarf!